← October Cook the Books! Essentials of Classic Italian Cooking Review and Wrap-up! December! A year ago, Briggs and I schemed up this little thing we later called Cook the Books. We hashed out the details over beers at The Beveridge Pub, spent time in the library and bookstore pouring over possibilities, and ultimately decided to just go for it. I dove into cookbooks and cooked with a purpose. For me, the cooking was an escape from the grief of my Dad’s illness, and ultimately his death, and a way to keep cooking when all I really want to do is crawl in bed and let everyone fend for themselves. I ended up needing it, more than I ever could have known when we hatched the plan. For the last month of Cook the Books we are going in a bit of a different direction. We will dig into a book I’ve had my eye on since it was released, The Homemade Pantry: 101 Foods You Can Stop Buying and Start Making. You already know that both Briggs and I like to push ourselves to grow a lot of edibles of all sorts, preserve, and create food from scratch. In fact, one of the varied reasons we both started blogging was because of an interest in preserving. We started with the Can Jam as a push to further our DIY-ways. Including a DIY-focused book in the Cook the Books lineup seemed natural. So many of you already prepare meals regularly that don’t use boxes, cans, or so-called “convenience” items. A lot of you regularly preserve what is in season for use year-round. This book will cover things that you might still buy from the store that you could easily make at home. Let’s face it: we all have different ideas of what makes something worth making yourself. Taste? Cost? Ease of making? Time? General interest? Availability? Ingredients? It all plays into the equation. For me, I know there are things I could make. Things I wish I was inclined to make, but I won’t for a variety of reasons. But, there are other things that I know would be simple to make. Things that would be cheaper, tastier, and healthier if I made it myself. It is fun to look through and see what we’ve already accomplished this year that are included in the book (pasta, corn tortillas, pie crust, and ice cream for starters). So, if you haven’t mastered some basics, you can meet up with them again! 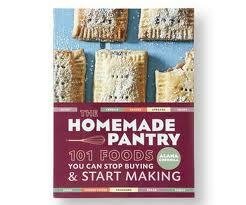 The book is loaded with things I haven’t tried to make (toaster pastries or fig “newtons” anyone?) and I’ve got my eye on a few things in particular. Yogurt. I swear, this will be the month I finally make yogurt. If it kills me. I sort of can’t believe I don’t make my own yogurt. Or at least that I haven’t even tried. Granola. I’m always on the look out. Then I can compare my usual method and the Dahlia Bakery recipe with the Homemade Pantry version. Granola bar. Is there really a single store- or home-made that is actually good? And keeps well enough? And only has things I like? I’ve not found it. And, with past long distance athletic endeavors I am certain I’ve tried nearly every store version ever made. And, they are all kind of different shades of horrid. We will see! Ketchup. I’ve made it before, but I was the only one that liked it. Plus, I have a ton of tomatoes I have frozen from a bulk buy and I’d like to see if they are up for the ketchup challenge. Pancake/Waffle mix. I’m a fan of Alton Brown’s pancake mix. It is tasty, flexible, and foolproof. But, I’m open to possibilities. And, I haven’t made up a mix in a while, despite making pancakes and waffles nearly every week. Pudding. Because pudding rules and there just isn’t enough pudding in my life. Graham crackers. On my long time list of things to make. Regular crackers. I love crackers. All kinds of crackers. I have big plans for the crackers. Just you wait and see. So, Cook the Bookers! That will round out the 2013 Cook the Books Challenge! We are so glad to those of you that participated and grateful to those following along! Get your post in by December 28/29th or so and we’ll get you in the final Wrap-Up. Want to catch up with the year in review? November– The Dahlia Bakery Cookbook Review & Wrap-Up coming this week! This entry was posted in Cook the Books! Cookbook Challenge, Cookbooks, Kitchen and tagged 2013, alana chernila, Cook the Books, december, homemade pantry cookbook. Bookmark the permalink. 6 Responses to Cook the Books! December: The Homemade Pantry! I cook from this book quite a lot! I think you’re really going to enjoy it.I make the granola bars often and they keep for at least 2 weeks. they may keep longer but they just don’t last in our house. And good luck on the yogurt making! I really enjoy our homemade yogurt. Thanks! I’m excited– and good to know on the granola bars! December!! I like how you outline your hit list. Top of mine for the month (guaranteed eyes bigger than stomach scenario, or at least grand ambitions…. ): yogurt, toaster pastries, cereal bars, jerky, chocolate pudding, mayo, cheese crackers, fig bars, peanut butter cups, beef stew, roasted butternut squash soup, potato leek soup. Maybe veggie burgers and some tea blends too. Get on with your badass self!! That would be impressive to say the least!